In what’s being called a breakthrough in advance of the UN Climate Summit (COP21), countries put another nail in coal’s coffin. Members of the 34-nation Organization for Economic Cooperation and Development (OECD) agreed they will no longer finance new inefficient coal-fired power plants, cutting off public funding for 85% of coal plants in the pipeline. As of January 1, 2017, the world’s wealthiest countries will stop subsidizing these plants through export credits – a policy the Obama Administration has been pressing for. Export agencies typically finance 5-7 coal plants a year, and many banks follow OECD guidelines for their lending practices, so this should have a ripple effect, Jake Schmidt of Natural Resources Defense Council (NRDC), told the Washington Post. "This agreement is a sign that using scarce public financing to support overseas coal expansion is coming to an end. It will help spur more renewable energy opportunities by redirecting this financing towards climate solutions instead of climate destruction," Schmidt says. "This is a big step forward," an Obama Administration official told reporters. "It removes a kind of negative carbon price, and puts clean energy technologies, like renewable energy, on a stronger footing to compete with higher-carbon energy sources." Over the past seven years, OECD countries helped finance over $35 billion worth of coal plants, supporting a quarter of the 15.3 gigawatts of new plants that have come online since 2005 (outside of China). Two years ago, the US Export-Import Bank, the World Bank and European development banks put this policy in place, with some loopholes. As part of the climate agreement with the US, China will pull back on funding high emissions projects in developing countries, eliminating Japan’s objection. To get Australia and South Korea on board, a compromise was accepted that allows OECD countries to continue providing export credits for coal plants with carbon capture technology and for slightly less efficient plants of 500 megawatts or less in countries where at least 10% of the population has no access to electricity. That’s even though solar and wind makes much more sense for people without electricity – because they don’t have access to the grid. "While this deal represents an important advance on coal finance, it also creates a serious obligation for OECD countries to vastly step up financing of broad-scale clean energy projects in developing countries, or they risk justifying critics who contend they are denying the world’s poor access to the energy they need to escape poverty. Clean energy finance will be a key issue in Paris climate negotiations," Paul Bledsoe, a climate official in the Clinton Administration, told the Washington Post. In related news, Britain announced it will close all coal plants by 2025. After crushing its renewable energy industry, the conservative majority favors expansion of natural gas and nuclear. And in Japan, Environment Minister Tamayo Marukawa blocked construction of two new large coal-fired power plants, which together would produce 2.3 gigawatts of electricity. 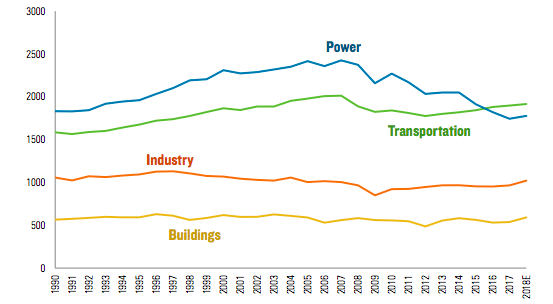 Worldwide, coal consumption peaked in 2013, and will likely drop 2-4% this year, despite near decade-low prices, according to a report by the Institute for Energy Economics and Financial Analysis. 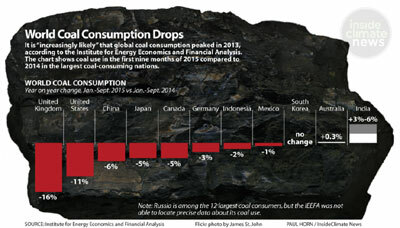 This year, China – which uses half the world’s coal – cut consumption 5.7% and in the US, use is down 11% from last year. Among the biggest users, only India and Australia increased consumption – other countries are either flat or declining, reports InsideClimate News.